France's Laboratoires Klorane has specialized in hair care for more than 30 years and all their outstanding products are designed to be in harmony with Nature and to provide gentle, natural solutions to every type of hair care and scalp problem you may have. Made only from carefully selected pure plant extracts, and made with the greatest of scientific care and precision. with Pomegrante Extract is rich in tannins and so highly astringent.This gives it the ability to fix color on keratine,so the color last longer. to enhance natural highlights for white or grey hair. A very gentle cleansing base allows the scalp to be washed often without an oily rebound effect. Contains no artificial coloring or bleach. Safe for color treated hair. Hypoallergenic product. For dry, brittle hair with split ends. A gentle cleansing base has been selected to cleanse dry, fragile hair, while a plant derived detangling agent smoothes down the hair shaft. Helps hair regain its natural softness and shine. For dry, permed or color treated hair. With Klorane oil of safflower shampoo, dry and damaged hair becomes more resilient and supple so perms and color treatments last longer. with Oat Milk, for frequent use. Has a powerful softening and protective effect on the scalp and hair shaft. 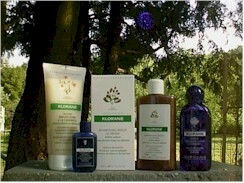 Klorane gentle shampoo with oat milk enhances the beauty, softness and lightness of the hair. The colour-fixing properties of this balm are reinforced by a lipo-repairing complex which nourishes hair damages by coloring.The balm restructures and rebuilds the hair while smoothing the hair shaft,leaving the hair protected and its colour radiant. No-Rinse For Fair or Light Brown Hair,Golden glints hair care with Camomile Extract - A no rinse conditioner for fair or light brown hair. Camomile and vinegar restores radiance to blond hair. It gently brightens hair color and makes detangling easy. For dry, brittle hair with split ends. Known for its high essential fatty acids content and remarkabble penetrating ability, Mink Oil nourishes the scalp and helps replenish the natural protective coating of the hair. Hair regains softness, shine and brillance. Hypoallergenic product. For color treated or permed hair. Exceptionally rich in essential fatty acids, restructures even the most sensitized hair deep down. Brings back tone to permed hair and revives the brillance of colored hair. Hypoallergenic product formulated to minimize any risk of allergic reaction. Cornflower smoothing and relaxing patches for tired eyes. 7 packs x 2 patches each. the soothing and decongestant properties of Cornflower extract. This very gentle lotion easily removes eye make-up, yet ensures perfect tolerance. Klorane Wild Cornflower Eye Make-up Remover, Waterproof, enriched with decongesting Cornflower extract, this very gentle lotion has a dual-phase formula which quickly removes waterproof make-up.